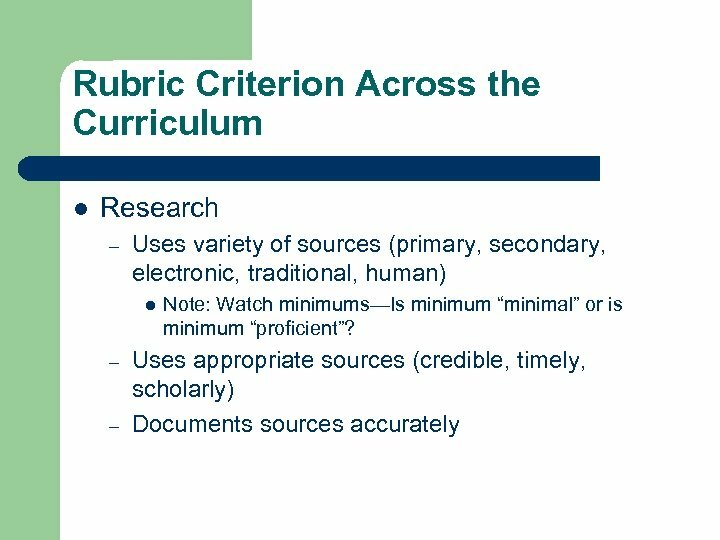 What is a Rubric? 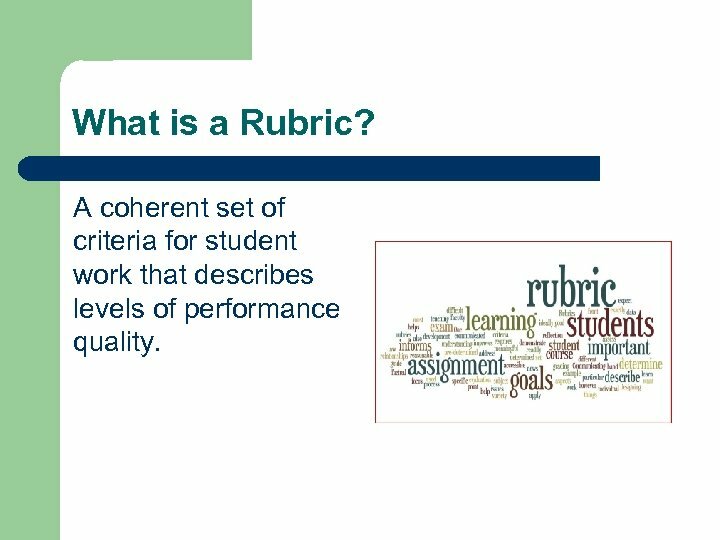 A coherent set of criteria for student work that describes levels of performance quality. 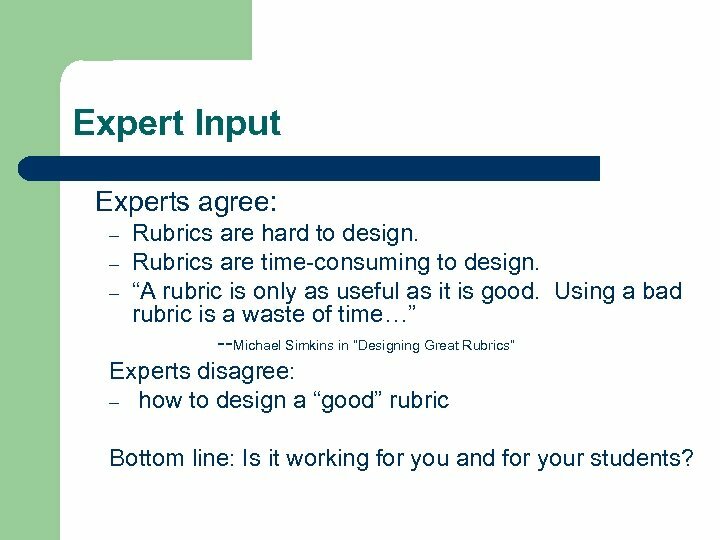 Expert Input Experts agree: Rubrics are hard to design. 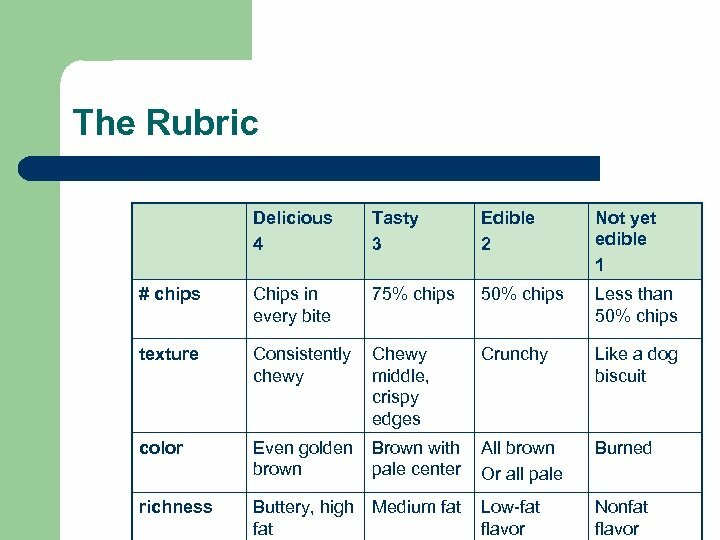 – Rubrics are time-consuming to design. 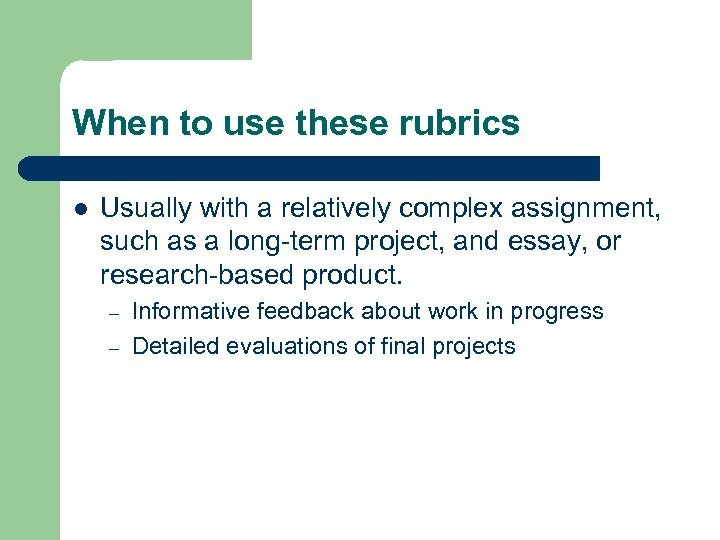 – “A rubric is only as useful as it is good. 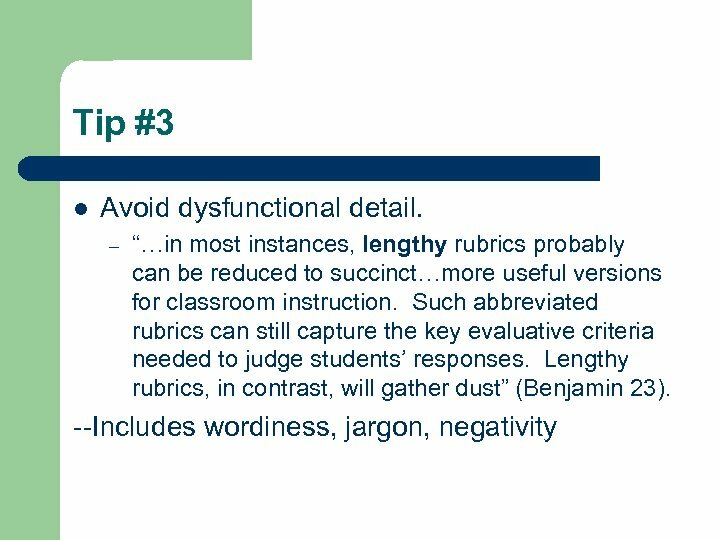 Using a bad rubric is a waste of time…” --Michael Simkins in “Designing Great Rubrics” Experts disagree: – how to design a “good” rubric – Bottom line: Is it working for you and for your students? 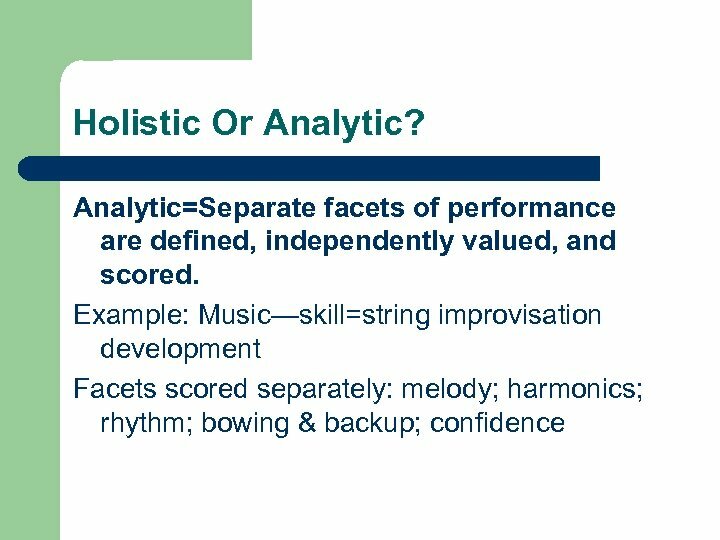 Holistic Or Analytic? HOLISTIC—pros and cons +Takes less time to create. 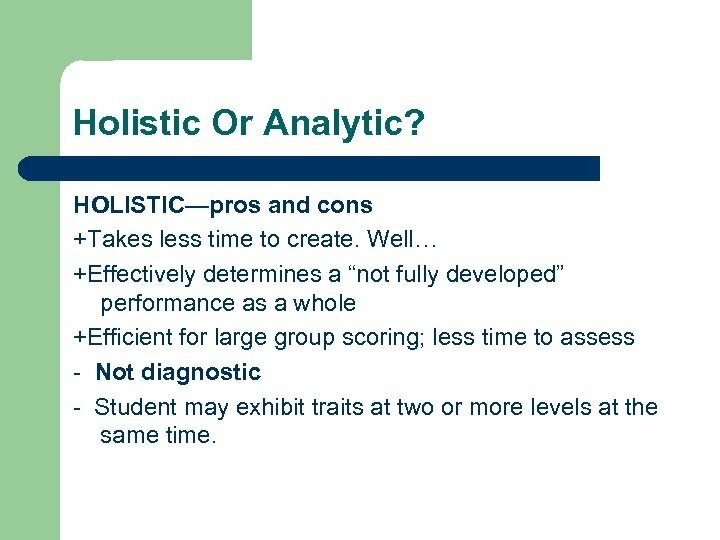 Well… +Effectively determines a “not fully developed” performance as a whole +Efficient for large group scoring; less time to assess - Not diagnostic - Student may exhibit traits at two or more levels at the same time. 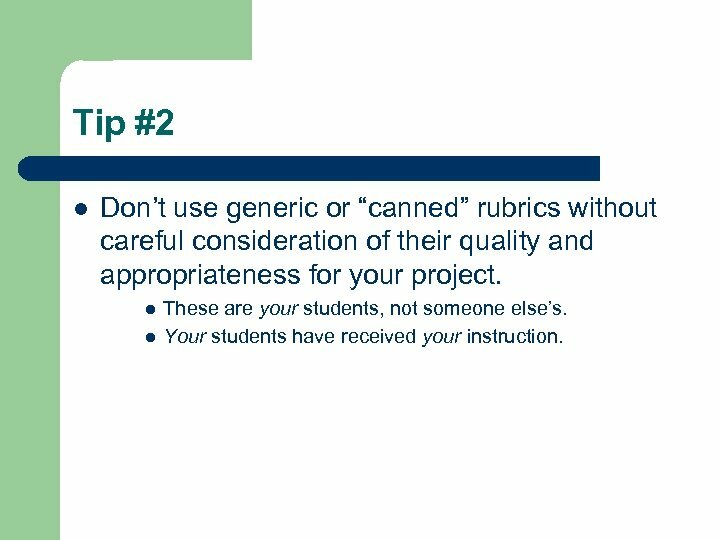 Tip #2 l Don’t use generic or “canned” rubrics without careful consideration of their quality and appropriateness for your project. l l These are your students, not someone else’s. Your students have received your instruction. 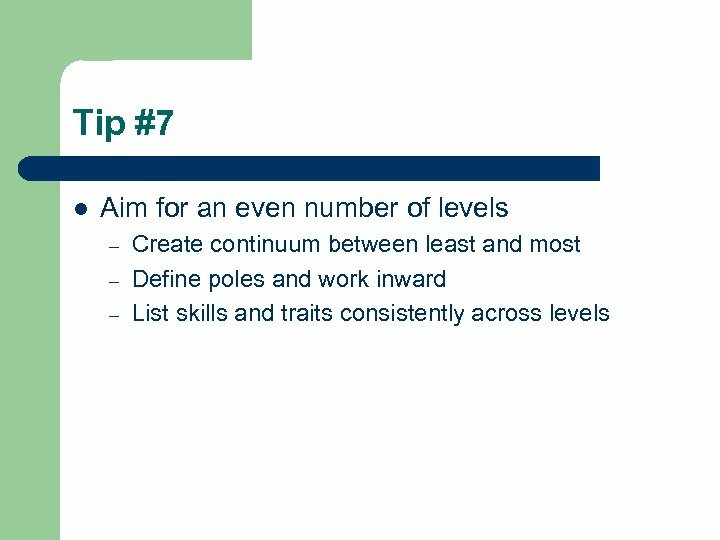 Tip #4 l Limit the number of criteria – – What’s really important? 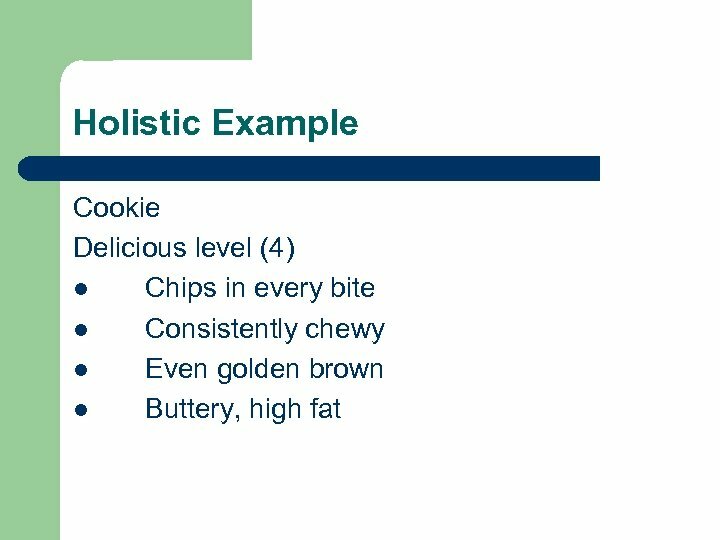 Don’t combine independent criteria. 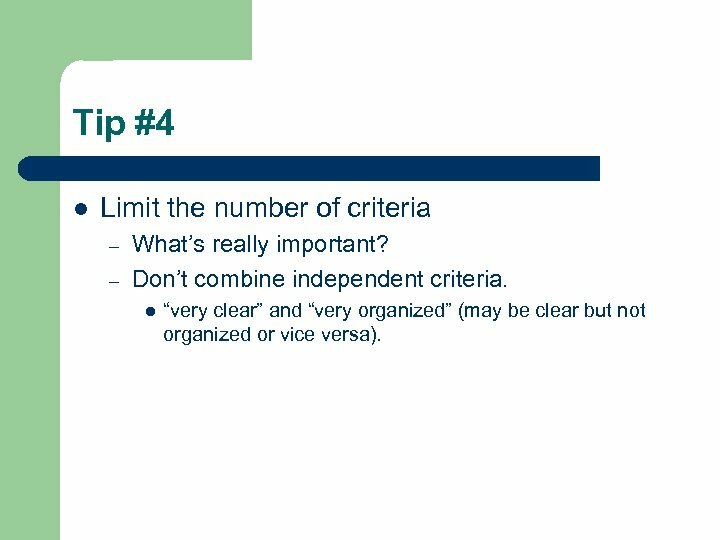 l “very clear” and “very organized” (may be clear but not organized or vice versa). 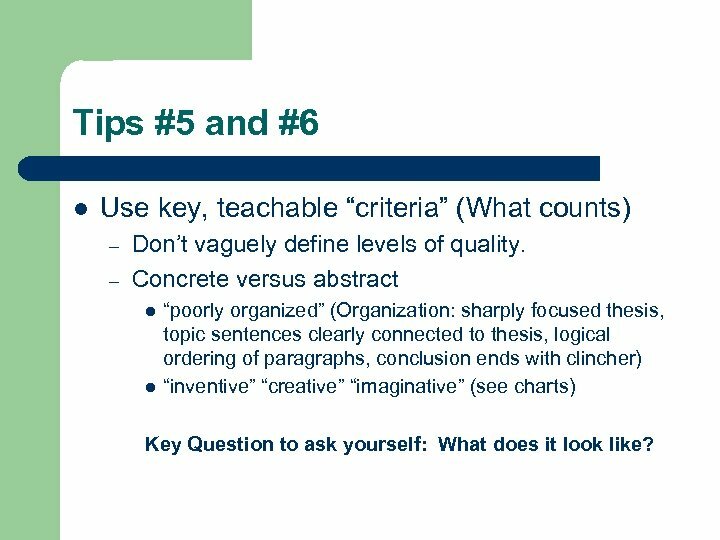 Tips #5 and #6 l Use key, teachable “criteria” (What counts) – – Don’t vaguely define levels of quality. Concrete versus abstract l l “poorly organized” (Organization: sharply focused thesis, topic sentences clearly connected to thesis, logical ordering of paragraphs, conclusion ends with clincher) “inventive” “creative” “imaginative” (see charts) Key Question to ask yourself: What does it look like? 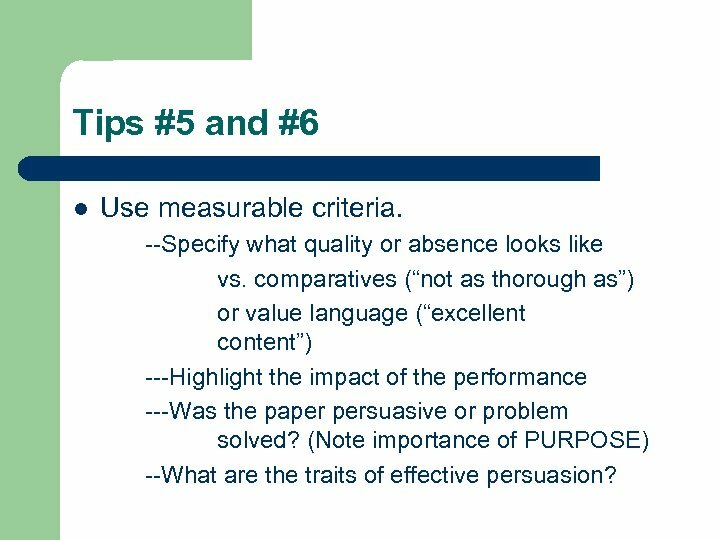 Tips #5 and #6 l Use measurable criteria. 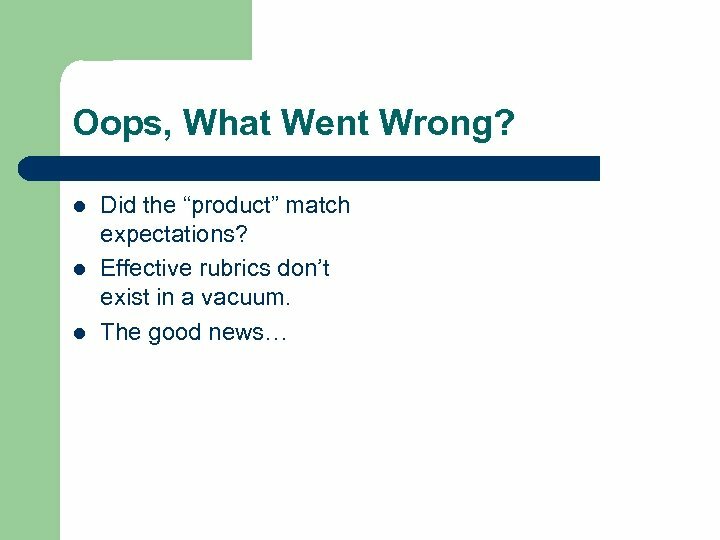 --Specify what quality or absence looks like vs. comparatives (“not as thorough as”) or value language (“excellent content”) ---Highlight the impact of the performance ---Was the paper persuasive or problem solved? 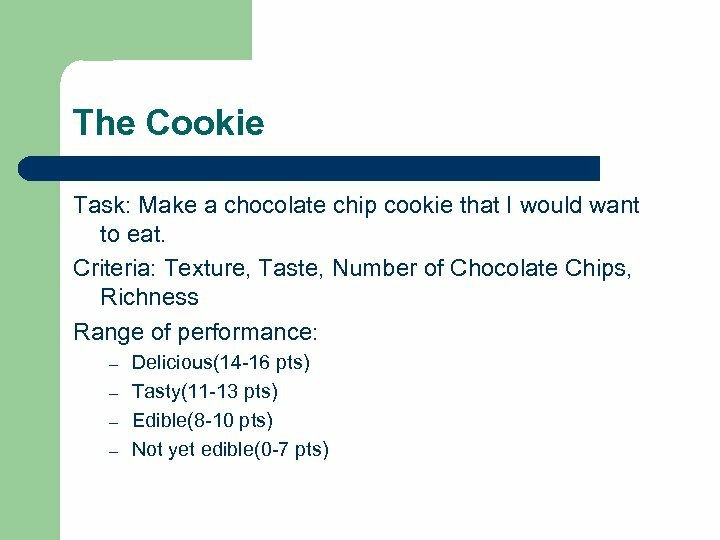 (Note importance of PURPOSE) --What are the traits of effective persuasion? 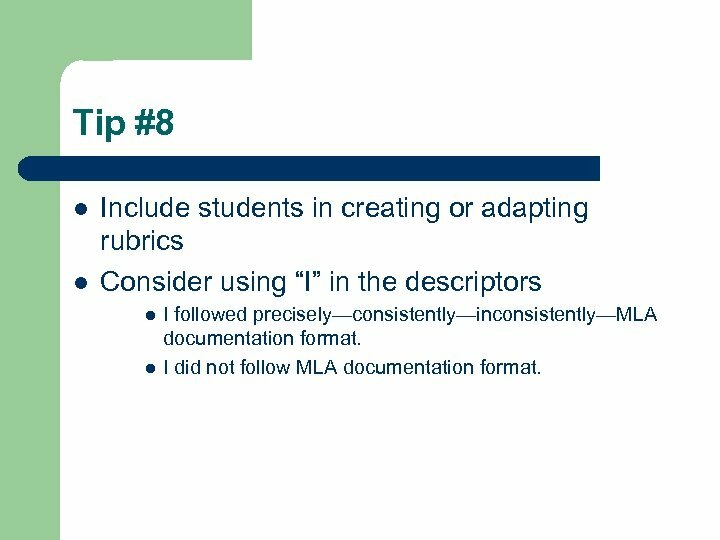 Tip #8 l l Include students in creating or adapting rubrics Consider using “I” in the descriptors l l I followed precisely—consistently—inconsistently—MLA documentation format. I did not follow MLA documentation format. 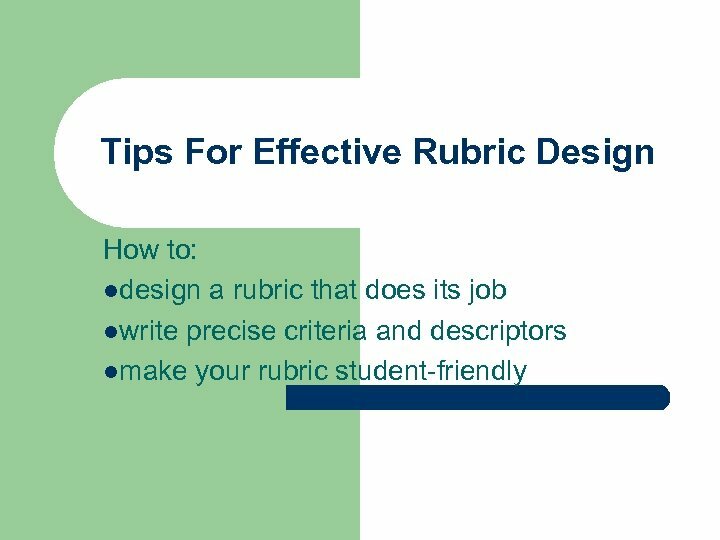 Tip #9 l l l Motivate students to use rubric. 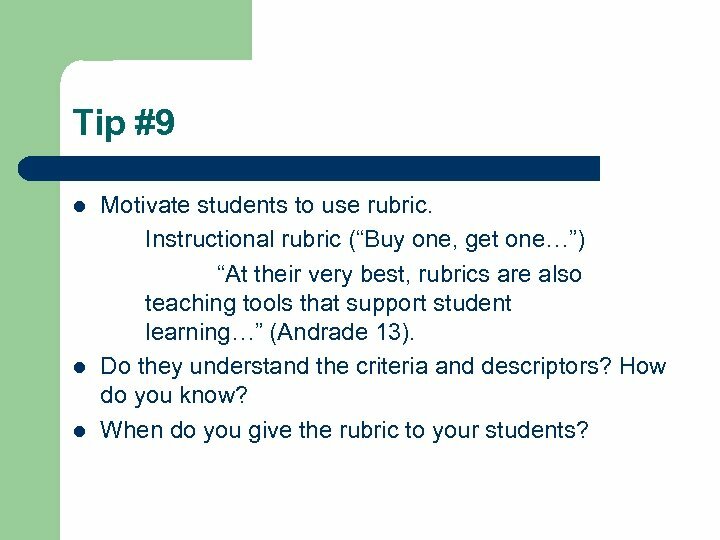 Instructional rubric (“Buy one, get one…”) “At their very best, rubrics are also teaching tools that support student learning…” (Andrade 13). 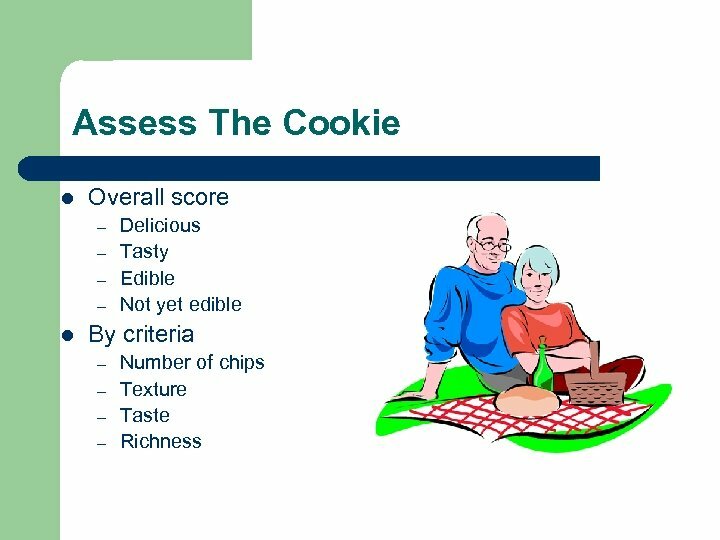 Do they understand the criteria and descriptors? How do you know? 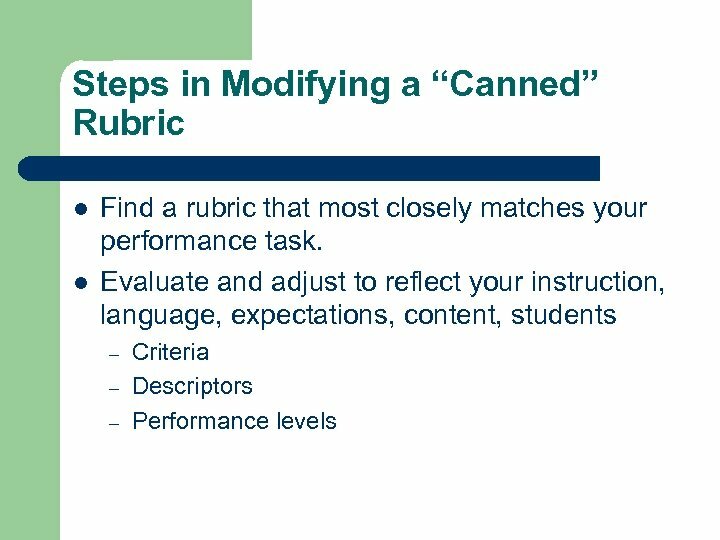 When do you give the rubric to your students? 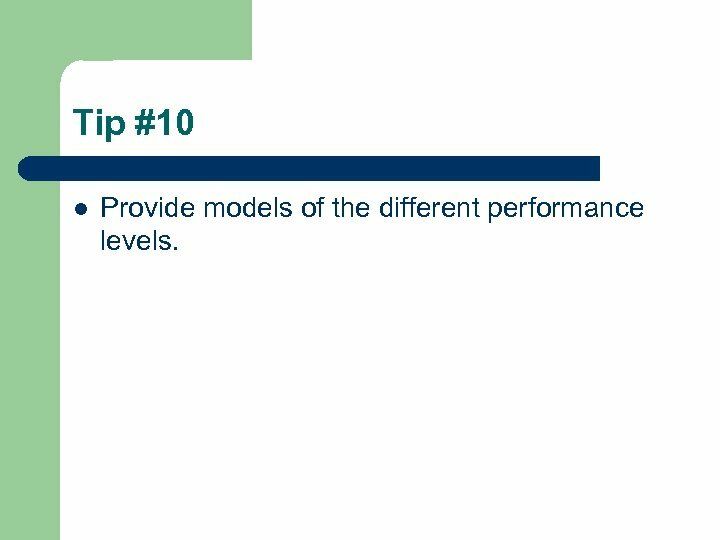 Tip #10 l Provide models of the different performance levels. 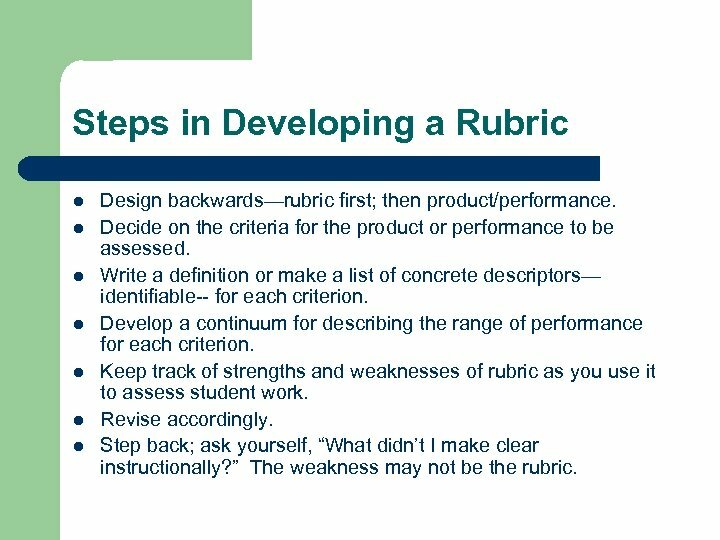 Steps in Developing a Rubric l l l l Design backwards—rubric first; then product/performance. 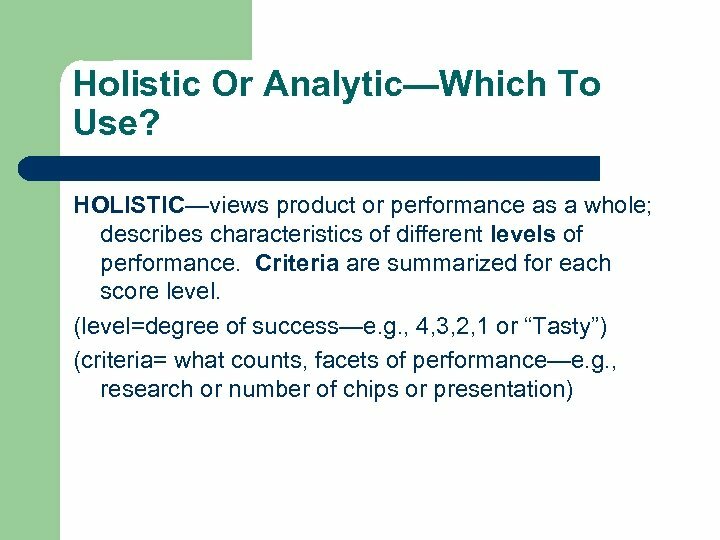 Decide on the criteria for the product or performance to be assessed. 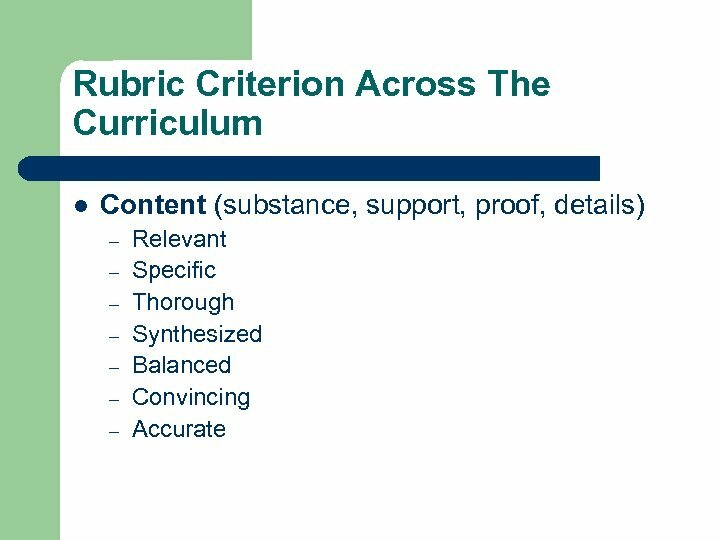 Write a definition or make a list of concrete descriptors— identifiable-- for each criterion. 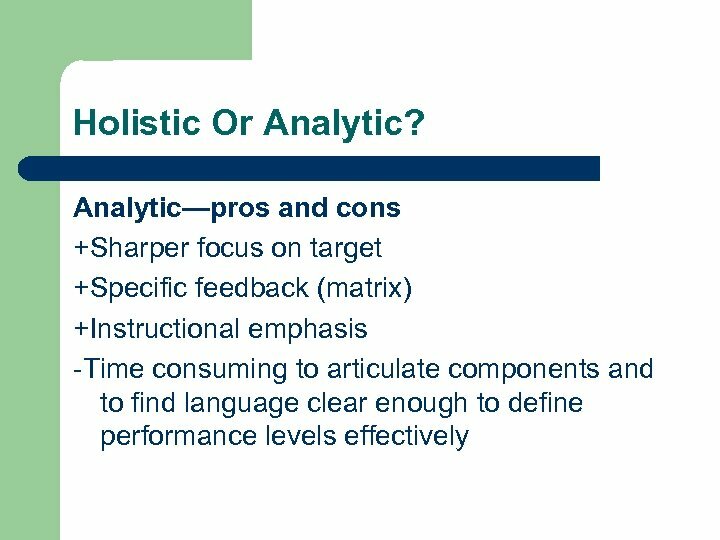 Develop a continuum for describing the range of performance for each criterion. 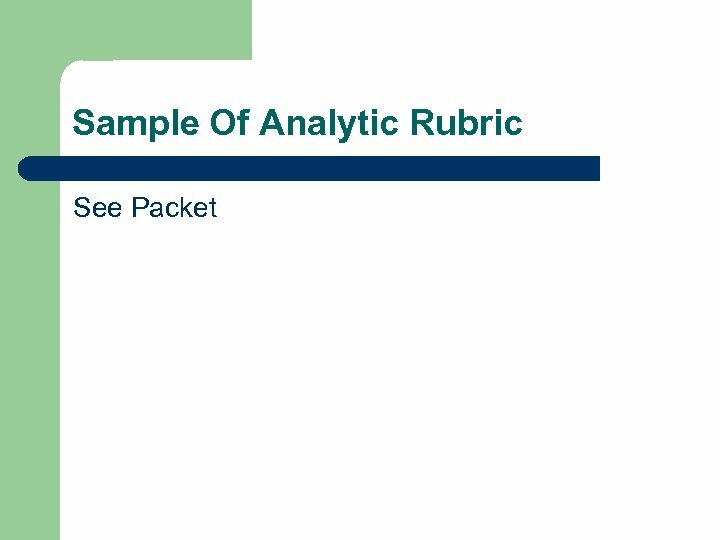 Keep track of strengths and weaknesses of rubric as you use it to assess student work. Revise accordingly. 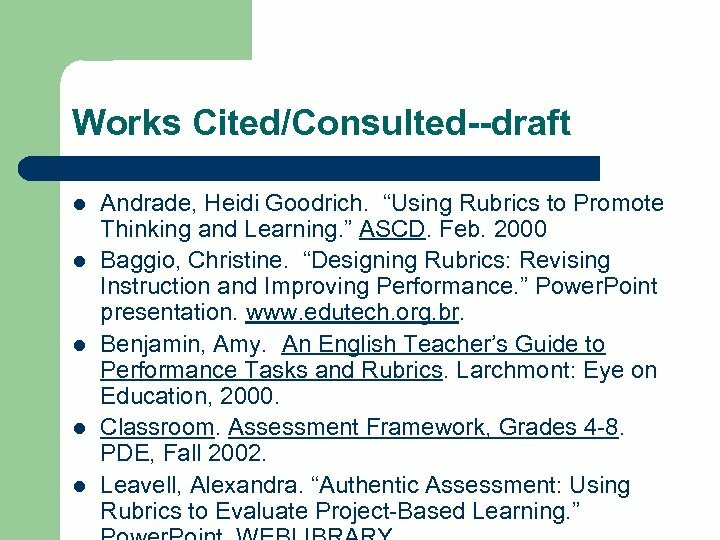 Step back; ask yourself, “What didn’t I make clear instructionally? 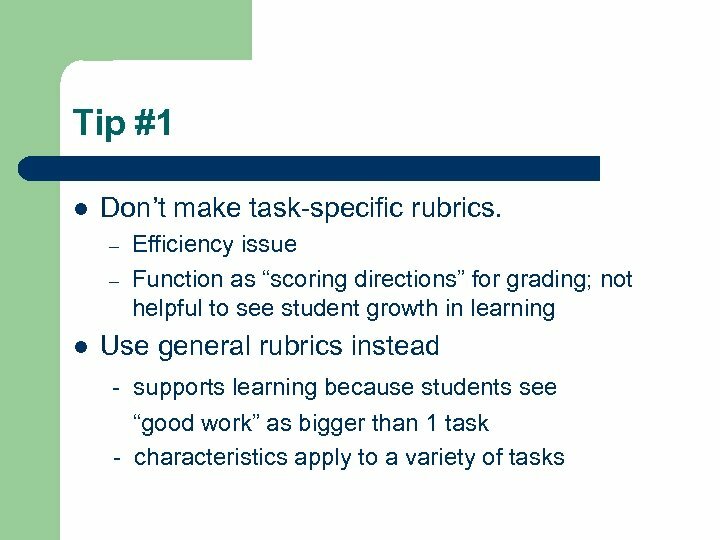 ” The weakness may not be the rubric. 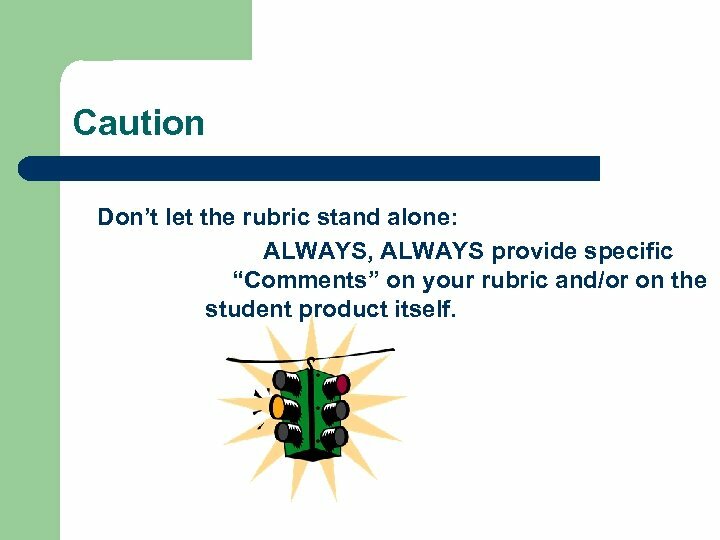 Caution Don’t let the rubric stand alone: ALWAYS, ALWAYS provide specific “Comments” on your rubric and/or on the student product itself. 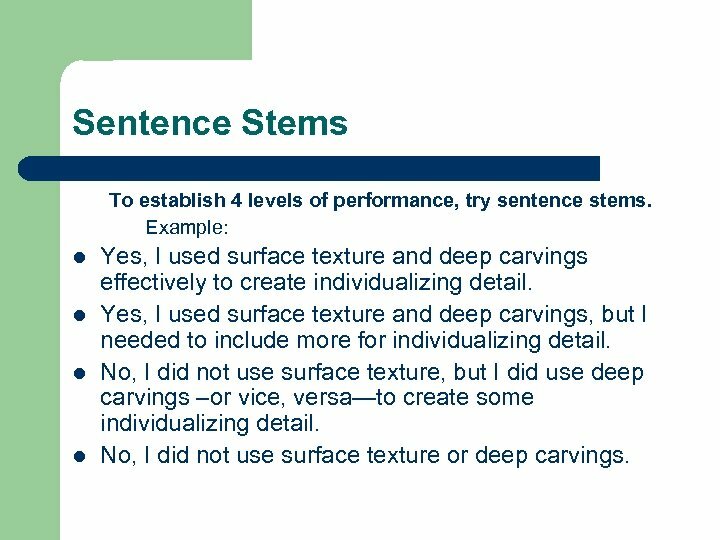 Sentence Stems To establish 4 levels of performance, try sentence stems. Example: l l Yes, I used surface texture and deep carvings effectively to create individualizing detail. Yes, I used surface texture and deep carvings, but I needed to include more for individualizing detail. No, I did not use surface texture, but I did use deep carvings –or vice, versa—to create some individualizing detail. No, I did not use surface texture or deep carvings. 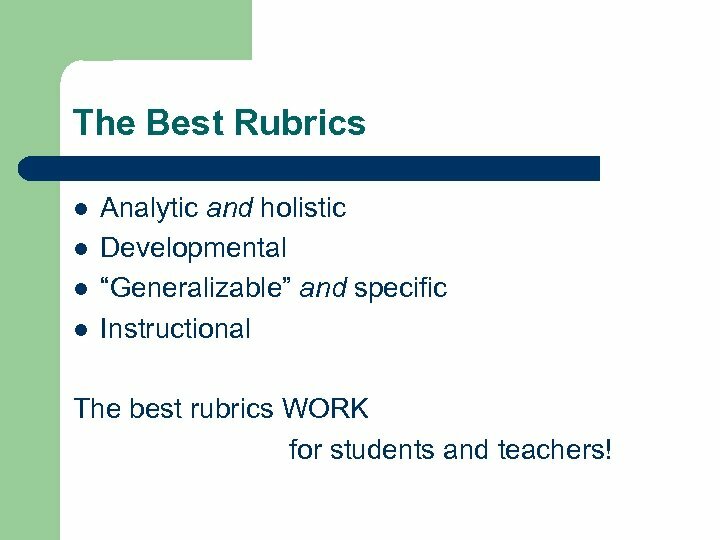 The Best Rubrics l l Analytic and holistic Developmental “Generalizable” and specific Instructional The best rubrics WORK for students and teachers!